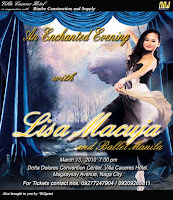 Everyone is invited to watch what could be Bicol Region’s FIRST Ballet concert, to be performed by the pride of Philippine Ballet, the impeccable Lisa Macuja-Elizalde. Perhaps this is the first time you will watch a Ballet performance LIVE, as the kings and queens watched it hundred years ago. On March 13, 2010, we bring to you a magical odyssey with Lisa Macuja-Elizalde and Ballet Manila, as they try to put twenty five seasons of contemporary dancing in this Ballet concert that includes excerpts from Nutcracker, Don Quixote, Giselle, Romeo and Juliet, Swan Lake and others at Doña Dolores Convention Center, Villa Caceres Hotel, Magsaysay Avenue, Naga City. Lisa Macuja-Elizalde holds numerous major awards such as the Special Prize for Artistry by the House of Diaghilev in Moscow (1992); Bodily Kinesthetic Intelligence Award (2005); Outstanding Female lead performance in a Dance Production; 5th place, International Diaghilev ballet Competition in Moscow, Russia (1992); and was a semi-finalist, USA International Ballet Competition, Senior Division in Jackson, Mississippi (1990). Drawing on her experiences at the front lines and highest echelons of the ballet world, this great Ballerina’s savoir-faire in professional dancing is a grand experience to look forward to.